Signage within a school environment is imperative. The image of your school is of utmost importance and first impressions really do count. Foamex boards are an effective way of guiding both visitors and students in the right direction at an affordable cost. These can be used indoors for class names, directional signs and anything else you can think of! Dibond boards are an excellent option for an outdoor sign, with a long life expectancy. These boards can be die-cut to any particular shape to match your school logo. They can be finished in anti-vandal laminate for extra protection. Vinyl adhesive stickers are perfect for window coverage, easy to apply and remove as necessary. Posters speak for themselves! They can be laminated or supplied just as they come. 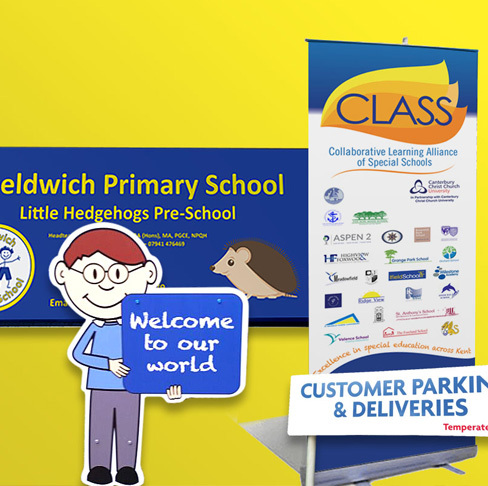 Just call for a quote on 01474 564738 or email sales@barrettprintforschools.co.uk for samples or prices.